Assistant BYU professor, author, and artist Anthony Sweat created the “feature image” for a new book (From Darkness Unto Light, by Michael Hubbard MacKay and Gerrit J. Dirkmaat) that depicts the translation of the Book of Mormon. 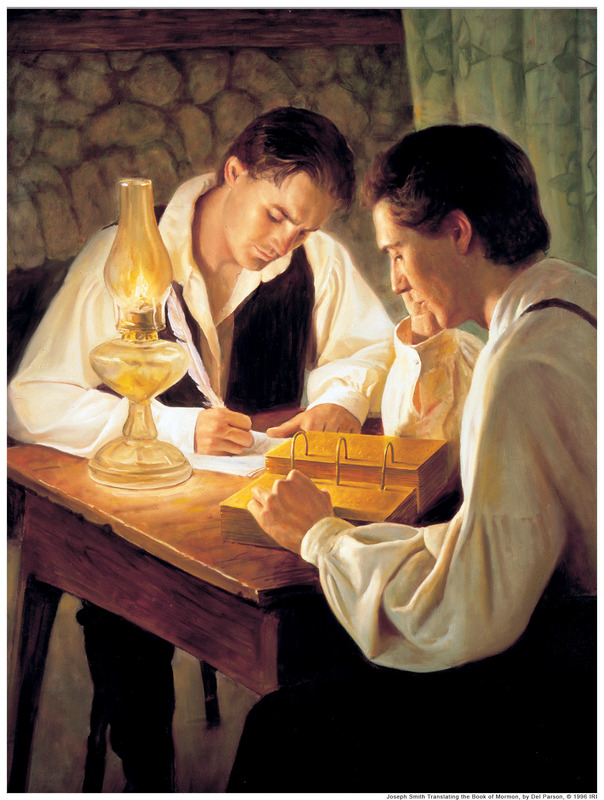 His painting includes the historically accurate image of Joseph Smith preparing to gaze into a hat, where his seer stone is (presumably) housed. In an appendix to the book, Dr. Sweat discusses the tension between art and history. The article is essentially an apologetic for the Mormon Church’s oft-criticized tradition of depicting Joseph Smith’s translation of the Book of Mormon in a historically inaccurate way. Dr. Sweat suggests the reason is the wish of the artists (or editors, etc.) to convey certain feelings and ideas that cannot be conveyed via a historically accurate illustration. A picture of Joseph Smith with his face in a hat will not communicate the ideas of revelation, inspiration, prayer, pondering – that is, the claim that Joseph Smith was receiving a revelatory gift from God. 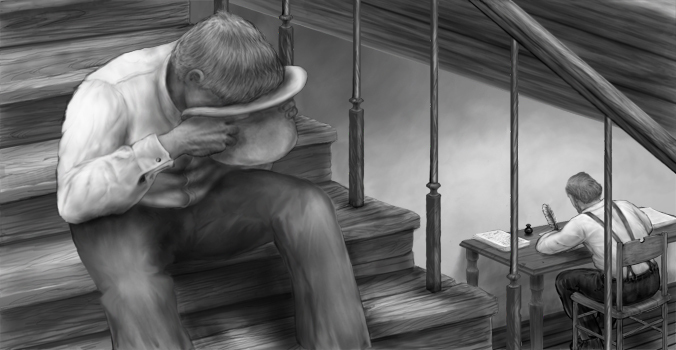 Joseph with his face buried in his hat actually communicates illness at best, perhaps occult activity at worst; neither a picture faithful Mormons want portrayed. In other words, knowing that, as Dr. Sweat says, “images often shape our perceptions of history as much as, or perhaps more than, many of the scholarly works about history,” the Mormon Church purposefully achieves a sort of “historical rewrite” of the Book of Mormon translation process by continually representing the historical event using a non-historical image that communicates a different idea – the idea that the Church wants people to embrace. The historically accurate details “detract” from the feeling generated by the Church’s faith-promoting narrative, so it changes the presentation of the details. In his thoughtful apologetic essay, Dr. Sweat has but confirmed what the critics have been saying all along. This entry was posted in Book of Mormon, Early Mormonism, Joseph Smith, LDS Church, Mormon History, Mormon Scripture and tagged Anthony Sweat, Book of Mormon, Church of Jesus Christ of Latter-day Saints, Mormon Church, Mormon History, Occult, Seer Stone. Bookmark the permalink. I fear that most Mormons will have little interest in learning the truth about Joseph Smith’s translation of the golden plates using a “seer stone” in a hat. And I doubt that they will wish to learn about his practice of other occult arts or the magical “Jupiter Stone” talisman he wore his entire adult life. See D. Michael Quinn, Early Mormonism and the Magic World View. A 2014 research study may provide an answer. It suggests that people are much more likely to feel good about engaging in vices (like ignoring the truth) when they are instructed to do so by an authority figure. In the study, two groups were offered chocolate cake. One group was told they didn’t have to eat it; the other group was told they had to eat it. Both groups were then tested for guilt. Surprisingly, the group instructed to eat the chocolate cake felt much less guilt about having done so. “This study suggests that when vices enter the fray, having less of a choice…actually makes us feel better.” Mental Floss Magazine, July/August 2015, p. 17. Evidently, when Mormon leaders order their members to avoid literature that they don’t consider to be “faith promoting”, most Mormons don’t feel guilty that they haven’t diligently sought the truth. They consider the burden to seek the truth to have been transferred to the shoulders of their leaders. So, you see, when Mormons tell you that they don’t want to know the truth, or hear about seer stones in a hat, even though the Bible instructs them to seek the truth, those Mormons are obeying their Prophets and they actually feel very little remorse about having violated one of the fundamental principles given us by Jesus Christ. Thus, the LDS people firmly believe they will not be held accountable for consciously ignoring the truth. Unfortunately, they are not the ones who will make that decision. It’s Dr. Sweat’s explanation that needs a little work, not just the paintings. It’s just more LDS mumble jumble. The LDS church does not want people asking the questions that a true rendering would bring. Then I wonder, did the artists really know about the rock in the hat trick? This religious group does not like to present things as they are. They prefer the creative narrative. For example, did the witnesses to the golden plates really see them with their physical eyes? Nope! It was reported that they saw them with “the eyes of faith” or “the eyes of their understanding”. Could we please get an artists rendering of Joseph Smith and his 33 wives. Include the fourteen year old girls please. This sort of thing would cause the average chapel TBM to have to come up with some sort of fantastic explanation in order to maintain their testimony. Misrepresenting certain things which are a part of their history , not being fully transparent about them, has been a hall mark of Mormon leaders behavior . Things are changing only because more and more LDS demand answers . The recent church essays are the latest attempt by Mormon leadership to calm their members down , but unfortunately these essays still don’t give enough answers and so many LDS will still be wondering about certain aspects in their history . Maybe one day every LDS will have full access to all historical documents in their Church’s archives and the First Presidency’s private vault . In reading what Sharon posted about what this Mormon author has said about the head in a hat issue , it seems that he use a lot of ink to try ( vainly) to rescue Mormon officials decision to not offically portray in pictures for so long what historical sources have mentioned about Joseph Smith with his head in a hat as part of the Book of Mormon translating process . What Dr Sweat does is resort to “muddying the water ” thereby making this issue appear as no big deal etc. However , conscientious LDS will not be satisfied with his anemic defense concerning this issue , nor should they . In the last few days I’ve had a very intense back-and-forth with a young Mormon acquaintance on fb. It’s all pretty predictable. He finally gave his I KNOWS in all caps I guess for emphasis. He also suggested that I needed to talk with the MM to get the real scoop on the LDS church etc. It’s really funny in a way because I’ve been down this road so often with Mormons that it’s predictable. Stage 1 is when they tell me I don’t know what I’m talking about and don’t know Mormonism. Stage 2 is where they have to conclude that yes, I do have accurate information and do know something about Mormonism. Stage 3 is when they get frustrated, accuse me of criticizing their one true church, then giving me their testimony and Stage 4 they run away and disappear. But as so many former Mormons will tell us; you never know when something you’ve said might be the impetus to their slow slide out of the LDS church. Sometimes something as trivial, it might seem to us, as seeing Smith with his face shoved in his hat might do the trick. The whole purpose of LDS art is to hook people into the program or to “sustain” the faith of those who are already true believers. I’m just wondering if the people who produce the art are true believers or folks who know the score but are purposely dishonest in the portrayal. In the past, we’ve discussed the different types of Mormons. The most common terms used today are “chapel” Mormons and “internet” Mormons. The latter were around well before the internet age but they are the ones who have a clue but stay in the LDS church for a variety of reasons. The former are folks who are totally sold on the five points of the Mormon testimony and get a burning in the bosom by the art. I’ve seen the picture of Jesus and Heavenly Father appearing to Joseph Smith. The true believers have no clue that Smith had eight versions of his first vision story. The first was that he went into the woods to receive assurance of the forgiveness of his sins. Now whether the guy actually went into the woods or not is up for debate in my mind. His final story sounds a lot like the one Christian evangelist Charles Finney told regarding his conversion however Finney didn’t claim to see God the Father. I’d like to see a picture of the mob attacking William Law’s printing press because he exposed what Smith was up to in Nauvoo with all of the women. But to a chapel Mormon there’s have to be an acceptable explanation. Those so-called “chapel” Mormons neither need nor want the truth. They’re perfectly happy in their own little Mormon cocoon, filling their days with Mormon activities, and talking with other chapel Mormons. They’re happy to stand up in testimony meeting and bear witness to things they suspect aren’t true, but they really don’t care if those things are true or not. When I pointed out some of the “difficulties” in Mormon history and theology to one such chapel Mormon, his response was, “Hey, come on, let’s just talk about the good stuff.” When you mention the flaws in Mormon art to them, they talk about how the painting makes them feel good anyway. Ironically, chapel Mormons are disgusted by their Church’s killing of innocents at the Mountain Meadows Massacre and by the mere thought of polygamy. So they won’t discuss it. If they don’t let it into their consciousness, then it didn’t happen. Besides, it’s easy to live a happy life in the Mormon Church without ever thinking about the bad things. Sure, it’s contrary to the teachings of Jesus, but let’s not think about that either. For them, the truth is highly overrated. And John 8:32 ? Well, let’s not think about that either. And then think about the fact that for the men, this is a real ego boost and status; being in the priesthood, shooting for the brass ring of deification. So will the guy ask any questions? This is especially true if he’s being asked to pray for people and getting some “spiritual” rewards from it. I’ve read some critiques from former Mormons where they talk about the arrogant BYU types who get up and have a pat “vocal pattern” with which to deliver their testimony and make the old ladies cry with the sincerity. Would any of these guys want to give this up? You’re right. In fact, I’ve spoken with LDS leaders who have serious doubts about the Church but say they remain and serve because they are able to help people who need them. This is a very worthy motive, much better than staying because of the ego boost, but nonetheless dishonest. By the way, the LDS general authority who has championed the effort to only teach faith-promoting history, Boyd K. Packer, just passed away. He was President of the Council of the Twelve Apostles. So I’m assuming that an LDS artist rendering doesn’t have to reflect reality but simply be “faith” promoting. Perhaps worse than that, is the idea that the picture could be the artists interpretation of events. 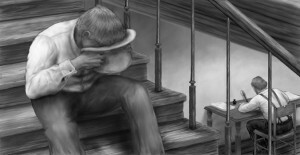 I’m wondering, then, if I could paint a picture of Joseph Smith wearing a dunce cap, sitting in a corner with copies of the BoM strewed about him on the floor. Perhaps I could draw the same picture with the imagination bubble above his heads with some gold plates in the bubble. I doubt if the LDS folks would like my interpretation of events from my point of view. But my drawing would be no different from their (drawing) if we are talking about artist license and interpretation. Patrick Henry was talking about our temporal salvation. How much more foolish and self-destructive is it to “shut our eyes against a painful truth” when our eternal salvation is at risk? Artistic license is one thing, deceptive portrayal is another. Dust motes riding on golden sun beams as purple and pink clouds float by in the window over lush green hills. That’s fine. No one’s complaining about the “pensive expression” on Smith’s face or Washington’s pose in the boat as they crossed the Delaware. Christian art (particularly catholic, but Protestant as well) is guilty of much the same. How many nativity scenes have we all seen where the animals are sitting around peacefully looking upon a sleeping baby Jesus while an angel flies overhead? How many pictures of Jesus show him as white skinned, blue eyed, 6 inches taller than everyone else and glowing? However, none of those nativity scenes depict Jesus standing in his diaper with a Bluetooth in his ear giving a lecture on astrophysics. Would it be “faith promoting”? Sure, but it would also be absurd and patently false. The whole point behind LDS art is to rev-up the emotions of the members and drive the commitment to the organization deeper. Then the folks think they are having real spiritual experiences when in reality it’s just a manifestation of their soul. How difficult it must be for the LDS member who starts to figure out that the church isn’t true and to reconcile all of these hyper-spiritual experiences they have had. At some point they have to figure out that it’s all been manufactured and reinforced. Personally there are a couple of “Christian” pictures that I like. One is Jesus walking along the road with two disciples after his resurrection. They haven’t recognized him as the Lord. The other is Jesus standing at the door and knocking. There is not door knob on the door. Very cool. I know the score on these pictures. They are the artist’s interpretation. They do inspire me. They make me feel good. I’m not going to base my faith on them however. Conference or Church publications means that they must not be , or ever were, an important teaching / act in their history . This is a clever way Mormon leadership keeps members attention from proper investigating their history and the teaching track record of past colleagues . The actual reason that Mormon leaders have not been consistently upfront or completely transparent with some aspects of their history is simply because those particular things don’t sell well to outsiders . This head in a hat issue is one example . The way Mormon leaders have handled Joseph Smith’s ( and others ) polygamy is another example . Smith’s love and devotion to Emma his wife . However , nothing is mentioned about all the other wives he had . Did’nt he love them as much ? Is’nt “family ” important ? All of the family ? Bottom line , Mormon leaders speaking in Conference about Joseph Smith have not been completely transparent about Joseph Smith ” family ” i.e. polygamy . Why ? The obvious reason it is a Mormon “gospel truth” that will not sell well to non Mormons , and even rank and file LDS were not supposed to hear of his actual family either. But the last several years there has been more and more LDS troubled about their history and asking for answers . Mormon leadership has been forced to be more transparent and thus released official statements ( Essays) that were designed to calm their flock down . Certainly this was a step in the right direction . But it appears that more should have been admitted to by Leadership . Maybe also one day all LDS will be able to see every document in the church historical archives and First Presidency”s own vault . The answer of course is not complicated — Mormons should dismiss their leaders as authorities in their lives and walk away from Mormonism . That can be a very difficult thing for many Mormons to do . God will help them transition to spiritual freedom . He loves the Mormon people and so do we . I was running through the basics of Mormonism with a friend of my daughter’s and it was quite a wide eyed open mouth reaction. You are absolutely right. The LDS church does not want an accurate portrayal of their religion out there on the streets. They have a world class PR machine that would rival any fortune 500 company. People jump into the LDS baptismal font with no idea of what they are joining. The hope of the LDS is that the convert will be Mormonized before they learn the nitty gritty information. Some never do learn it and are kept ignorant. It’s all “happy, happy, happy” rainbows and unicorns; a day at the amusement park. Everything must look good on the outside. I too have seen that look on people’s faces ( both non LDS and LDS ! ) when I shared with them some of the teachings Mormon prophets were not shy in teaching over the pulpit . I had the documentation with me to varify it . Today’s leaders are not of the same breed as their former colleagues concerning this issue , as they’re to busy trying hard to appear as just another Christian fellowship and thus enhance their chances of proselytizing . Sadly , but that behavior has worked far to often . The Provo Utah area is called ” Happy valley ” by it’s LDS residents ? I’m thinking that behind the scenes there is a fair amount of LDS who are not really happy people at all . Just my opinion .